CURE and FLDC Tokens Trade for bitcoin on Bittrex Exchange (and others). In the future, we plan to offer additional prizes in CURE and FLDC, however this promotion is intended to introduce a broader section of the public to Citizen Science who may not otherwise participate. 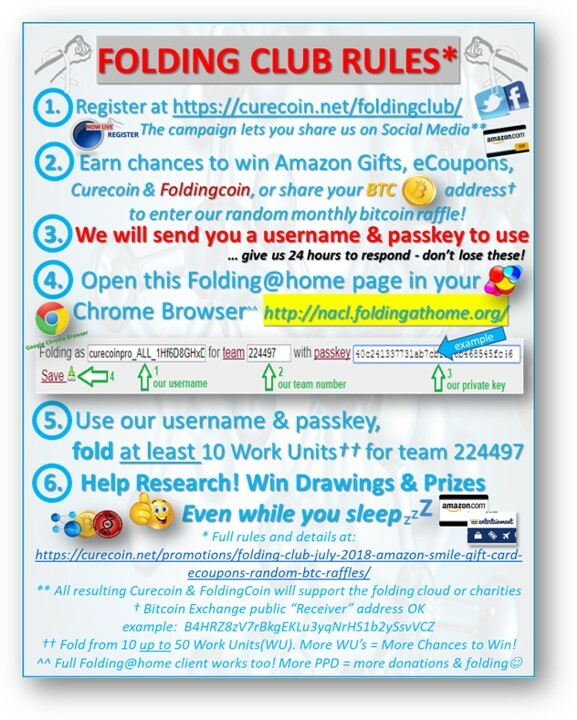 In the future, if you would like to contribute to Stanford research philanthropically, or earn your own Curecoin and Foldingcoin, we recommend you create your own passkey and follow merge folding instructions on either curecoin.net or foldingcoin.net websites. Folding Club is part of the Curecoin Project system (sponsored by Visions Made Viable, a 501c3 charity incubator). Check local laws; must be at least 16 years of age to participate in Folding Club raffles (US Law).